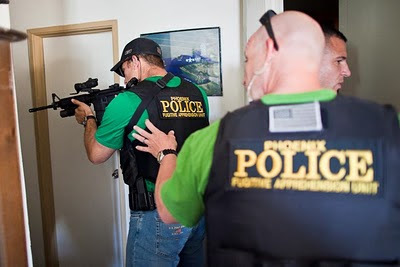 Earlier this week I went on a ride along for the Arizona Republic with the Phoenix Police Department’s “Major Offender Unit.” Their mission is to go after known felony offenders who have a variety of outstanding warrants, from fraud and identity theft to gun and drug charges and everything in between. Normally ride alongs are pretty sedate affairs. It’s hours of boredom, with, if you’re lucky, a few minutes of excitement. But this one was different. It was hours of excitement with a few minutes to catch our breath in between arrests. I was with the unit for four hours and they made five felony arrests in that time. And the four hours included our lunch break. A good day for the detectives, who made some good arrests (including a member of Hell’s Angels, who was busted for possessing a prohibited weapon, in this case a shotgun with a barrel shorter than 18 inches). And a good day for me because I was able to make a nice selection of photos. I made the photo above while officers cleared a house in central Phoenix. Inside the house they found the shotgun, a .357 magnum revolver and an impressive collection of swords. It’s a given that police work is dangerous, but you don’t appreciate the dangers these officers face on daily basis until you’re standing next to an officer who’s wrestling with a man in a truck and then finds a “Saturday Night Special” revolver on the floor of the truck after the man was pulled out of it. The revolver was inches from the man’s hand just before he was pulled out of the truck.